Designing a futuristic city that incorporates a sustainable engineering system to help grow crops in urban settings to better feed the community earned 3 students from the Harding Middle School in Cedar Rapids, Iowa, this year’s ASCE Most Innovative Design of Infrastructure award. 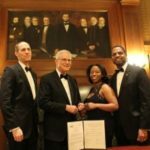 The city, named Juelra, took the honor at DiscoverE’s annual Future City Competition National Finals held in Washington, D.C., February 14-18. The Future City Competition, which is celebrating its 22nd year, is a national, project-based learning experience where students in grades 6-8 design and build cities of the future. Teams of at least 3 students, together with a teacher and engineer mentor, plan cities of the future by first researching and then writing an essay explaining their solution to an engineering problem. This year’s topic was “Feeding Future Cities,” and it challenged students to explore today’s urban agriculture, from aeroponic systems for rooftop farms, to recycled gray water, to the sustainability-driven farm-to-table movement. The goal was to develop a futuristic solution to growing crops within the confines of their city. Using SimCity Deluxe Edition software, the teams built a tabletop scale model using recycled materials valued at no more than $100; anything from discarded soda bottles to old shoeboxes. “I was so impressed by the presentations that the 6th- through 8th-graders made and the models they built of a future city focused on urban production of food,” says ASCE President Robert D. Stevens, Ph.D. P.E., F.ASCE, who was a member of one of the 6 preliminary judging teams for the overall Future City Competition. “It’s amazing how well prepared the students were and how much they understood about engineering. Since last fall, 40,000 middle school students from 1,350 schools have been engaged in the Future City Competition. Teams from 37 middle schools and organizations, each a winner of intense regional competitions held throughout January, participated in the Future City National Finals this year. Eighth-grade Harding Middle School students Julia Schulte, Shelby Olson, and Sara Zaiser worked under the guidance of their teacher, Shannon Haas, and volunteer mentor Gary Bishop, MSECE, SMIEEE, a retired engineer, who worked 32 years with Rockwell Collins in Cedar Rapids. The students said that after receiving the ASCE award and experiencing the Future City Competition, they are now looking forward to taking more engineering and STEM (science, technology, engineering, math) classes in school. The girls, who visited Washington, D.C., for the first time, added that winning the ASCE award is something they will remember for a long time. Iowa Future City Regional Coordinator Jean Oberbrockling says competing at the Future City Competition allowed students to learn the many skills needed to become an engineer. 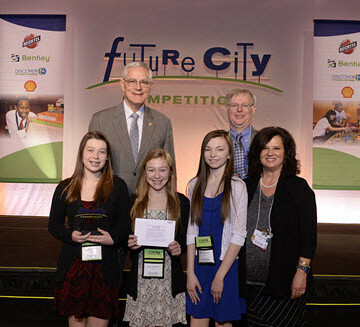 For the second consecutive year, the overall first-prize national winner of the Future City Competition went to a team of 3 students from St. John Lutheran School in Rochester, Michigan. For the design of their city of the future, Lekol-la-fre, students Leah Schroeder, Emily Abramczyk, and Abby Dayton won a trip to the U.S. Space Camp in Huntsville, Alabama, and $7,500 for their school’s STEM program, sponsored by Bentley Systems, Inc. The students worked under the direction of their teacher, Jon Pfund, and volunteer mentor Linda Gerhardt, Ph.D.
Second place went to West Ridge Middle School, from Austin, Texas, for their Future City, Aquatopolis. For their efforts, the school received a $5,000 scholarship for its STEM program, sponsored by the National Society of Professional Engineers. 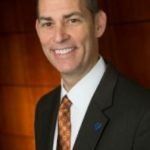 The Academy for Science and Foreign Language, from Huntsville, Alabama, took third-place honors for its Future City, Era Verd, and was presented a $2,000 scholarship for its STEM program, sponsored by IEEE-USA. Honorable mentions went to Linda Fletcher’s HEART of Science Cooperative from Rockwall, Texas, for their city Minato, and Queen of Angels Regional Catholic School in in Philadelphia, Pennsylvania, for their city Aresvita. Each received $750 for their organization’s STEM programs, sponsored by Ohio University and CH2M Hill. For information about Future City or to volunteer, visit www.futurecity.org.